Team India is currently locking horns with the Windies for the second ODI of the ongoing five-match series in Visakhapatnam. After winning the toss, the Indian skipper, Virat Kohli decided to bat first and they dropped the young Khaleel Ahmed. However, they were reduced to 40/2 in the 9th over after the dismissal of Rohit Sharman and Shikhar Dhawan early in the innings, but with the help of humungous century by the skipper, India reached the total of 321/6. During their quest to defend the total quite similar to what they chased down like a cakewalk in the first ODI, the Indian bowlers, especially the fast bowling duo of Mohammed Shami and Umesh Yadav. 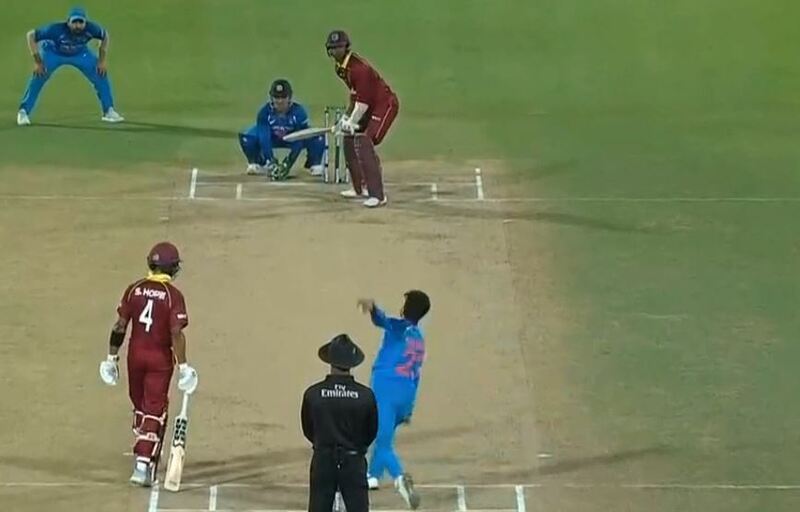 However, the men in blue got some redemption in the 12th over of the game when Kuldeep Yadav got the wicket of the veteran batsman Marlon Samuel and the Windies were reduced to 78/3 after the end of 12 overs. On the penultimate ball of the over, Kuldeep bowled a fuller length ball outside the off-stump and Samuels opened the face of the bat only to steer the ball towards the backward point boundary for a four. However, on the very next ball, Yadav bowled a googly which ended up Samuels getting bowled as he left with his bat hanging well away from his body, for Kuldeep’s bowl to sneak through. The ball hit the top of the bails. The umpires weren’t sure and needed to go upstairs as MS Dhoni’s gloves were very close to the stumps, but the third umpire also gave it as out. It was a rare ‘bowled’ dismissal which was decided by the third umpire. 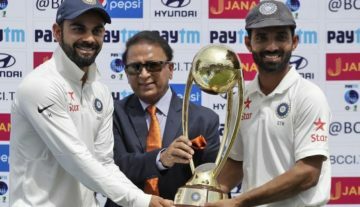 Sunil Gavaskar Out Of Border Gavasakar Trophy?